The problem of housing is one of the gravest concerns for the rapid-growing population. Anyone needs a house but not everyone can afford a good one. Growing families require more space; and older buildings gradually become unsafe and unhealthy to live in. Custom building services cost high; and even if you choose to build your house with your own hands, you need to spend much for quality materials. Besides, surrounding conditions such as bad soil or rocky ground can make the construction process even more difficult. So a simpler solution is needed. On the other hand, house-building companies are interested in developing more affordable products in order to broaden their customer base. One of the popular ways to build a house quickly and cheap is using bigger construction elements which would afterwards require less work to put them all together. Thus the technology of pre-assembled buildings is a good solution for both buyer’s and seller’s sides while the product quality is kept at a good level. People were constantly trying to optimize the construction technology throughout the whole history of human civilization. In medieval Europe, clean cut logs with specific carving were used to build custom houses without iron nails. Back then such technology of pre-assembled building was mostly used for wooden constructions because wood was easier to transport at long distances. The Industrial Age with its mass production caused the rapid growth of this technology. Standardization of details and improved transportation methods made it possible to deliver pre-assembled buildings almost anywhere. Besides, the demand for such houses grew dramatically. In nineteenth century masses of people moved from Europe to find a new place to live across the ocean. Naturally, they needed affordable houses to start with on the new ground. As a result, pre-assembled building businesses grew. For example, hundreds of such houses were shipped from England to Australia in the middle of the nineteenth century. In USA, the era of expansion to the Western territories created another boom of the demand for housing. By the end of the nineteenth century the pre-assembled building business there was so developed that in some locations pre-manufactured blocks could be ordered by mail. In the twentieth century this technology was taken to a new level with various new types of pre-assembled buildings appearing on the market. During the Second World War in-house built medical, armory, and storage facilities were widely for relocating troops and military bases all over the globe. The quality of those products was generally high enough so that even today some buildings of that era are being utilized in some locations. Today the variety of materials used for this type of construction is not limited by wood. Plastics, advanced steel types, polystyrene, and different wooden materials treated with chemicals are used to manufacture high quality construction elements which weigh less, are more resistant to weather and physical stress, can preserve warmth and have extended lifecycle. Modern house building technologies allow creating materials which are resistant to bacteria, fungus, mold, or fire. Besides, factory built construction block are manufactured according to ecology standards making cheap pre-assembled buildings friendlier to the environment. A lot of standards for living conditions have been developed recently. They contain basic requirements for space, light, sanitation, air conditioning etc. Also, numerous standards exist for organizing safe and productive work in offices and production facilities. They are highly important for any company because it is obliged to provide acceptable conditions for its staff. It is much easier to ensure the implementation of all these standards in case of a pre-assembled building because it is constructed from standard in-house built elements whose quality is guaranteed by a producing company. 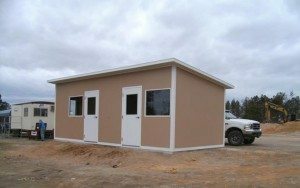 Many different types of pre-assembled buildings exist today. It can be a small block or a two-storey house. Such a building can be delivered as a finished product; otherwise it is transported in parts which are to be put together at the destination place. Finally, this category includes both residential and non-residential buildings such as storage facilities, offices, shops, booths, production facilities etc. These buildings are used all over the world; they are especially popular in USA, in Europe, in China, in Australia, and in South Africa. In modern world, people are less bound to one place. Things can change fast. In such a situation it would be wise to consider instant moving to a new place as an option. You can find a nice job in another corner of the country or need a climate change, or just feel tired of the old neighborhood. In such a case ordering a pre-assembled building could minimize the time of a family relocation. Such houses can be customized for certain ground types and other specific surrounding conditions. Besides, they usually can be reconfigured in the future, in case you would want to make some rearrangements. Finally, construction elements manufactured in proper conditions have better quality and will therefore be more durable and safe. Non-residential pre-assembled buildings are no less popular. 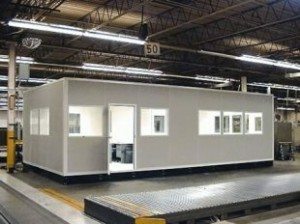 Booths, workrooms, storage buildings, shops and other facilities which come in ready blocks could be a good solution for a modern business. A company may experience quick changes resulting in closing or opening departments, or quick relocation of its assets. In such a situation, obtaining cheap, easily reconfigurable and easy-to-transport facilities is an excellent choice.